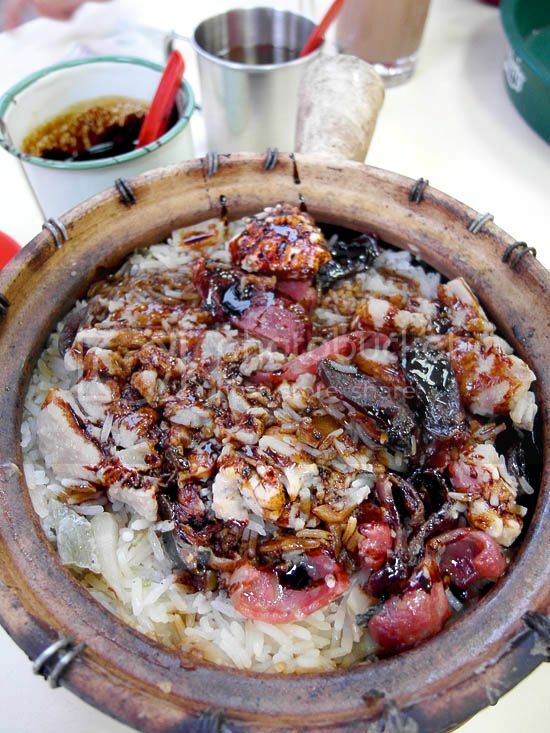 Whenever someone mentions about the best claypot rice in Singapore, the same few names will always appear: the famous Geylang Claypot rice at Lorong 33, Golden Mile Claypot rice, Old Mother Hen’s at Geylang, and of course New Lucky Claypot rice at Clementi. I don’t usually eat a lot of rice during dinner. The only time when I eat a lot of rice, is when we are having claypot rice. I like the idea of putting-everything-into-a-pot. It’s not only convenient, but just imagine all the actions happening inside: flavors of the different ingredients mingling together, like a cocktail party of sorts. But do you know what’s the best part about having Claypot rice? They give you a large mug of oil and dark soy sauce. I don’t know about you, but I’m always tempted to pour as much as I can into the claypot. This isn’t the time to worry about calories and high cholesterol. But if you feel guilty, have a tomato after dinner – that’s what I usually do after a heavy meal. At New Lucky Claypot rice, prices start at $10 for two, and there’s the $20 serving for a family of four. We had the $10 portion, with more than enough of lap cheong (Chinese sausages), liver sausage (darker in color), chicken chunks, and salted fish to go around. It is absolutely necessary to call and make your reservation (let them know what time you will arrive, and the number of people) before going, otherwise the average waiting time is typically around 45 minutes. Where’s your regular place to go for Claypot rice in Singapore? I love their Claypot rice! And whenever I’m there, I’ll also check out what soup they have! Malaysia has reeeeally awesome claypot rice! And it’s cheaper over there too! oh dear, this looks gorgeous! I tried the one at kallang airport food centre vey nice gt slit of chicken which are very tender and juicy and the salted fish is of very good quality too… $10 dollar is really worth the $$ for 2 person!!!! B try the soup too very nice too the salted vegetable duck soup.. They have shifted to Block 44 Holland Drive hawker centre since November 2011. It’s still as good as before and the wait still as long. Bon appetite.